There’s a man in the whisky business whose sense of smell was once insured for £1,600,000. So vital was it for his job as master blender at Whyte & Mackay, Richard “The Nose” Paterson went to great lengths to secure his livelihood. And what would life be without the scent of baking bread, the aroma of a fine whisky or the head of a ripe and fruity beer? Coupled with its wingman, taste, the sense of smell opens us up to experiences that make life worth appreciating, a whole dimension of enjoyment at our nose and lips. Conversations in the pub about the latest releases become colourful when we have names and labels to place on flavour, but the differences in opinion show just how subjective this is. How then does the food and drink industry establish what flavour and aroma is, and how do manufacturers make sure that time after time, their tasty products match up to expectations? It’s the millions of tiny hairs called cilia we can thank for our sense of smell. These miniature detectors pick up smell molecules from across the room, as they waft in the air towards us. Sensors connected to the cilia light up in excitement upon binding with the molecules, pushing a signal to the brain via a pathway called the olfactory nerve. Ultimately, it’s the brain that smells for us, not our nose, which is simply a detective for our computer minds. Just like a database, our brain is full of memories of scents over the years, and not just the smells, but the experience of those smells too. Craving chocolate cake? You’re not just after a rich cocoa hit, but the lingering effects of grandma treating you to a surprise indulgence on your 8th birthday, or that perfect night in with the rain outdoors and the warmth and comfort of a Netflix and chill inside. The sensation of taste is about 80% smell, but a crucial 20% comes from flavour, and we detect that with our mouths. Between 2,000 and 10,000 taste buds live there, and they’re not even limited to our big tongues (the only free-ended muscle in the human body), but the roof and walls of the mouth, the throat, and the oesophagus. This time, cranial nerves and taste bud receptors called papillae pick up microscopic flavour molecules from our food and drink, and send a signal over to the olfactory nerve endings in the roof of your nose. Ever been encouraged to breathe through your nose while chewing or drinking to maximise the taste? It’s to vacuum up these aroma and flavour molecules to the top of your nose and throat, where they are most warmly received. The nerve endings then signal the olfactory bulb on the underside of the forebrain. The bulb is responsible for sending smell “messages” directly to two more nerves in the brain that communicate with the brain area responsible for the perception of taste - the deliciously named gustatory cortex buried in the middle of our craniums. Aromas feel like they come from the mouth because their signals end here, along with the ones from taste. 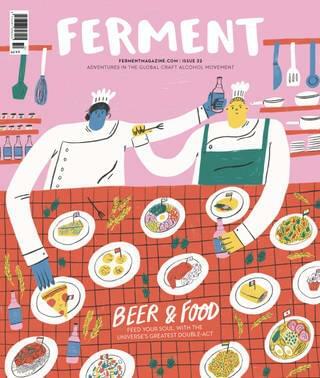 “What we experience as flavour we attribute to the mouth as it’s where the physical contact happens, but it’s a multisensory process,” explains Nikki Welch, author of The Pocket Guide to Beer and qualified gastronomist. It sounds like a long journey, but these signals take place over milliseconds. The saying “one man’s meat is another man’s poison” comes to mind when considering how individual taste can be. “The intensity of receptors differs from person to person and is highly individual, the higher the intensity of receptors for a certain taste, the higher the sensitivity. So, someone with a sweet tooth for example would actually have a low number of receptors for sugars,” explains Nikki. The fewer the receptors, the more sugar someone needs before they register it as sweet. Blame your biscuit addiction on genetics! And broccoli haters can unite - sense of bitterness is also genetic. We have a receptor sensitive to sulphur compounds, like those found in dark leafy greens, which are typically aversive (and sometimes toxic - think strychnine or cyanide). But some people have an insensitive version, and better hope they don’t find themselves in an Agatha Christie novel anytime soon. Plus, those who hate coriander because it tastes like soap, but can’t fathom how others don’t detest it, the answer is again genetic. The consumer genetics company 23andMe researched this and came across two common genetic variants linked to people’s perception of “soapy” flavours, on a gene that codes for a receptor highly sensitive to the aldehyde chemicals that coriander contains. All of these perceptions and more come into play when we detect taste. Even vision and hearing is important too. “As the brain is designed to identify patterns it takes all of these elements, along with sight and sound, and creates an image of the ‘flavour’ of what we are consuming,” explains Nikki. Imagine the snap, crackle and pop of Rice Krispies and if you’ve got a sweet tooth, your mouth will surely water. Look at someone drinking a beer, and you’ll be rushing to the bar. Because of all these influences, food and drink manufacturers spend a lot of time developing and refining their products until they’re just right, concentrating on balance of basic flavours, mouthfeel, look and even sound. “A combination of chemical and physical analysis is always used in conjunction with human perception” to measure taste in a manufacturing setting, says Nikki, who has worked with many wineries and Fallen Brewery in Stirling. “Some elements are obviously easy to measure through traditional chemical analysis: residual sugar, alcohol, volatile acidity, bacterial presence etc.” One laboratory technique used is gas chromatography, a process that separates a mixture, and is used to identify the volatile, and therefore aromatic, elements of a product. Nikki explains, “The product is ‘split’ into its volatile elements that pass out as a gas and the distinct elements are then identifiable.” Ion chromatography is a newer technique that is fast becoming the method of choice for detecting amino acids, peptides, and proteins, carbohydrates and alcohols in beer. Taste and language are not inextricably linked, hence the fun in going to a tasting evening and debating what flavours and aromas are coming from your geuze, lambic or pale. Machines are vital in detecting objective levels of compounds that are responsible for taste and aroma, producing their own language for brewers, bakers and canapé makers to literally read their products’ insides. “There are now e-noses and e-tongues being used that take all of the measurable data and then run pattern recognition software to replicate the human process,” says Nikki, but surely these will never replace the wonderful creativity of the human brain in coming up with flavour associations, such as Richard ‘The Nose’ Paterson’s description of the rare 1951 Dalmore as landing on his lips “like a kiss”. Taste is out there for us to capture and enjoy, so do it while you can. After all, taste buds age and become less sensitive over time, all the more reason to enjoy a rich, bitter, cocoa-esque, tumultuous, brazen and forest floor-like pint tonight.